It would take a long time even to begin to understand this strange new country. 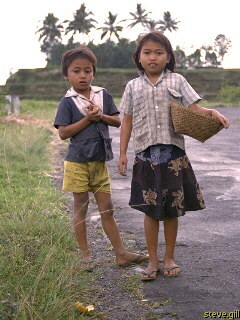 Somehow I find this picture, of two children we met while driving ourselves around Bali, brings back to me the feeling of wonder at the new world I discovered, with all its beauty and inequity. Back in Australia I took a couple of short courses in bahasa Indonesia and started to read all I could find about my new friend, Nusantara.